They're not doing things by halves when it comes to their seventh birthday celebrations at Two Birds. There's the not insignificant matter of a series of parties all over the country and three new beers too. Admittedly, only this one is technically a birthday beer but, when you've knocked out a couple of collaborations with London brewers in Melbourne for Good Beer Week, why not make them part of the fun too? 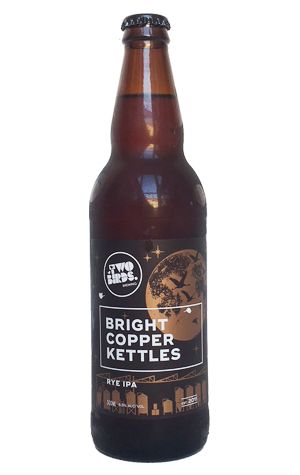 As for the official birthday beer, Bright Copper Kettles takes its name from The Sound Of Music and is another addition to the growing collection of IPAs to have left the Two Birds Nest in recent times. That said, it's one that makes as much – if not more – of a play of the malts that lie within, particularly the rye that contributes to the chestnut colour, the full, viscous body and the spiciness. Accompanying it are nutty, toffee and toasted malt characters, spicy, faintly fruity hops and a drawn out, broad and earthy bitterness. Quite the mouthful, as a celebratory beer should be.